USA Today best-selling author Tricia Goyer has written the novelization to the much-anticipated movie, Moms’ Night Out. Don’t miss this hilarious family comedy that celebrates real family life—where everything can go wrong and still turn out all right. And, look for the companion devotional written by comedian Kerri Pomarolli, Moms’ Night Out and Other Things I Miss: Devotions To Help You Survive. Tricia and Kerri have teamed up for the “No More Frumpy Mommy” challenge. Motherhood can sometimes seem like survival of the fittest. Every day brings its own troubles, and by the end of the day, you’re spent. Between school, soccer practice, cleaning, laundry, cooking dinner, putting away dishes, and keeping your kids from going at each others’ throats, the last thing on your mind is getting away for an evening. If that’s you, you’re invited to take part in Tricia and Kerri’s No More Frumpy Mommy challenge. Tricia and Kerri will choose 10 winners to receive a Fandango gift card to see Moms’ Night Out, as well as copies of Moms’ Night Out (the book) and Moms’ Night Out and Other Things I Miss. One grand-prize winner will receive $200 to put toward her own moms’ night out or her own moms’ night out “ride” (getting her car detailed and cleaned). GO HERE TO JOIN THE CHALLENGE! Not a fan of movies? This novelization of the Mom’s night out movie was just as funny as the movie. The small devotional guide, “Moms’ Night Out and Other Things I Miss: Devotions To Help You Survive”, will have you laughing at the insane craziness of the author, and shenanigans of her children. I found myself laughing through it and nodding as she took the extreme circumstances that she has faced in mothering, and hopefully embellished a little to make them more humorous for the audience. I never wanted to be a mom. I was a big sister, and I figured that I already had experienced enough chances at mothering with that. Little did I know that God had something else in mind for me, than my big plans. I still don’t always feel like the warmest, cuddly mom, but I love being a mom. Mom’s Night Out as a novel, was very similar to the movie, but gives you an inside look at what was going on in the characters minds as well. The real, raw feeling that Ally and her friends experience, can teach you some valuable lessons as you laugh and cry alongside her. This is a book you will enjoy! These books will speak to you and your mothering friends. It might inspire you to organize your own “Mom’s night out” a little more often, reach out to moms around you to encourage them, and give you some devotionals to try throughout the year. Best of all, it will make you laugh at all the crazy things we go through, and then say it is worth it! Check out the No More Frumpy Mom challenge as well! I realized that it is really the little things in life that often matter the most. One thing you shouldn’t do before going to bed at night, is read the articles online that are titled “7 signs your son is going bad” or “Snake appears in woman’t bathroom” or even “The danger in everyday foods”. Our lives are complicated enough, and then reading those types of things, can just really stress me out. They leave staring wide eyed at the ceiling, thinking about the mistakes I have made today, yesterday and likely will make in the future. I start stressing about the big things, and then I realize, it is the little things that make a difference. It is things like attending a family member’s music performance, giving that hug to someone who needed one, spending time helping someone clean when they couldn’t get to it, and dropping chocolate in the mail to a friend that needed cheering up. Sometimes, I stress that it is not big enough, so I never get around to the little things. I think it is not worth it, I am too tired (probably from staying up worrying about it all) or other excuses. We blame ourselves for failing this time or that time. I think often when our children look back, we will find that they will remember the little things more than the big extra things we did. They will remember you reading to them and praying before bed. They may remember the trip to Disney, but they might have just as fond memories of sitting around a bonfire in the backyard. For me, I learned that all my worry tells me to do what I can today, not to wait for tomorrow for when I think I can do the big things. Do the little things with them now, and they will be big things in their life tomorrow. 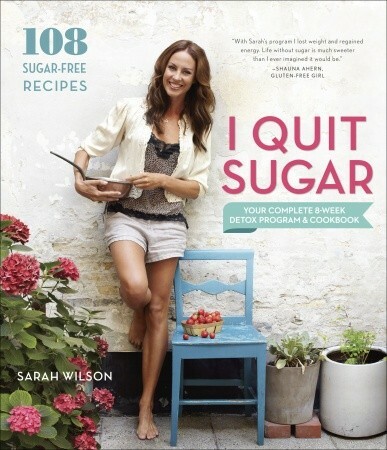 A New York Times bestseller, I Quit Sugar is week-by-week guide to quitting sugar to lose weight; boost energy; and improve your looks, mood, and overall health, with 108 sugarfree recipes. Sarah Wilson thought of herself as a relatively healthy eater. She didn’t realize how much sugar was hidden in her diet, or how much it was affecting her well-being. When she learned that her sugar consumption could be the source of a lifetime of mood swings, fluctuating weight, sleep problems, and thyroid disease, she knew she had to make a change. I Quit Sugar is a full color book with lots of pictures and textures, or so it appears on the page. It is very visually appealing to the reader that picks up this book to read. I received this book for review as I often have gone on special times where I cut out sugar for a time period to sort of re-set my blood sugar levels. I found the ideas she presented in this book very interesting. I was disappointed in the lack of science behind some of her reasoning. She claims that fructose is one of the worst sugars, and although she states that you can add it back in later after the 8 weeks, she claims it is the cause of all the issues. However, since science does not back that up, unless you have a serious blood sugar issue, natural fruit sugar does not react the same in your body and would be healthier for you than Brown rice syrup, which she uses throughout the 8 weeks detox. There are some fruits that are very high in fiber and actually can counteract the sugar content contained in them, if you are consuming them, raising your blood sugar to healthy levels to give you energy. She did not really discuss white flour or other white starches as a cause of any issues, but had recipes that contained brown rice syrup and white flour in the book. What I did like about the book was the idea that a short time off of all sugars can be a good thing for your body. It can help re-set your body to be able to feel better, have more energy and maybe even lose a little weight. She spoke about how adding good fats, cutting out the sugars in your life, can actually help with weight issues. I really liked that the recipes were photographed beautifully and they looked appealing. She took care in keeping the ingredients very simple, and has a guide in the back of the book for your pantry shelves. It would be easy to stock a pantry with the items she listed, and frugally as well, if you work at it. Overall, I felt this book was something that I will likely try some of the recipes and reference it a few times in my journey to cutting out sugar, but I will likely turn to other books for guidance as far as a long term lifestyle change. This book was provided for me by Blogging for Books. The opinions contained therein are solely my own! At the turn of the 20th century, Elli Korpela boards The Baltic with hundreds of eager women, all seeking new beginnings and brighter futures in America . . . as mail order brides. This short story that follows the Butterfly Palace mystery is determined to have a mystery of it’s own. A Mail order bride is not enough for this book, it needs to have attackers, torn apart houses and intrigue to draw these two strangers to one another. My own complaint was that I did not realize it was a short, so was confused at how fast the story developed, but quickly got past it and moved on! If you are looking for a quick, short mystery with a romantic mail order bride byline, this is the book for you! This book was given to me for review by BookSneeze. The opinions contained therein are solely my own! This tale is wrought with the pain and hardship that is tangible through the pages of the book. The author reaches out to you and makes you taste the fear that Gisela and others faced as they run for their lives and the lives of others around them. I was thrilled to learn at the end, that it was based on facts she had gotten from her grandmother. This book is a WW2 fiction book that you will want to experience, and it is an experience. The romance is very, very light and would be appropriate for a high school read, but it does talk about bombing, violence towards deserters, and other topics that may be distasteful, but done in a way that is factual. I will be looking for this author’s books to purchase and pass along to friends. It is not the easiest read, because the subject matter is the harsh reality of the war, but I found that was what also makes it appealing as a great read! This book was given to me for review, by Book Sneeze and the opinions contained therein are solely my own. This book starts with a whirlwind of activity, after a traumatic event happens, Tamsen finds herself trusting a stranger more than those she has grown up with. The storyline is very interesting. I struggled with the marriage of convenience idea a bit in this one, even though for the time period, it stuck closely to the likely scenarios that would have played out. This is well written, and done with skill to keep my attention. The struggles of the early settlers were very accurately portrayed, and the faith of the characters were beautifully done. I wished that there was a little more story line of how the actual relationship could have gone if they had not fallen in love so quickly, but that may just be my imagination! If you like marriage of convenience stories, check this one out. This book was given to me for review by Blogging for Books. The opinions contained therein are my own. When her aunt shows up homeless on her doorstep, Sara suspects anything but a miracle. Sara’s an artist with a supportive husband and a house that folks on her block admire outright. But she’s restless and bored with life. Then her legendary Aunt Bel shows up, wearing a smile after years without a word. Twenty years ago, fresh out of college, Bel left for a summer missions trip and never returned. Now she’s on Sara’s doorstep, looking for a place to crash. Sara can’t say no to family, even if she hasn’t seen Bel since she was a nine-year-old girl. But saying yes to Bel turns Sara’s whole precariously-balanced life upside down. The enigmatic Bel gives Sara’s family and their community a jolt of fresh thinking and clarity. But Bel is hiding something. Though she won’t talk about it, Sara soon learns that Bel has been through a hellish ordeal. And she has the burn marks to prove it. Lisa Samson has a unique style of writing. You sort of feel like you were transported into another place, this life between artists, creative people and the ones with weird relatives. I enjoyed reading about Sara, but the mystery of her aunt was difficult to figure out. I struggled through trying to solve whether she had a mental illness, had been abused or what the issue was. This author will for sure keep you reading, as you connect with the characters just enough to want to know what on earth is the story, but there is also the question you keep asking yourself as you read…”Do I really want to know?” and you have to keep going. Sara also has her own issues, she is facing past abandonment type issues that get brought up with Aunt Bel reappears. Her parents are divorced, and she tries to hold it all together. What I enjoyed was that the story wrapped up some of her issues, Aunt Bel’s issues and wrapped them together to show that issues cannot always be sewn up in a nice neat package. They are kind of convoluted and complicated. This book was given to me for review by BookSneeze. The opinions contained therein are my own.